Fabricated Hydro Jet Flow Gate Valves are precision manufactured throttling valves designed for high pressure / high head service to 400 psi. Built to U.S. Bureau of Reclamation specifications or designed for your application. Split body design with stainless steel gate, bronze gate guides and bronze seat ring. All components are fully machined for precise alignment. The bronze seat ring is tapered to direct the flow inward and prevent cavitation. Downstream side of the valve is larger than the upstream side for protection from cavitation. The valve is used primarily for free water discharge and flow control on dams and reservoirs. 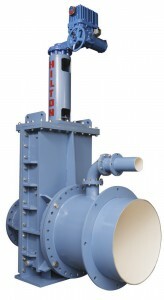 Unique features permit the valve to open smoothly in free discharge conditions, where there is pressure on the upstream side and zero pressure on the downstream side. Precise throttling capability from 0-100% range. Discharge hoods available.